The second game of my Konigsberg campaign was fought out this week, with my Russians pressing on towards the city. Having cleared the fortress in the first game, I faced elements of 5th Panzer Division as they conducted their afternoon counter-attack to hold the westwards corridor from Konigsberg to Pillau port open. I have some good period maps of the area (and Google maps, less useful, but it gives some information), and went searching for a suitable actually location for our armoured clash. I chose an area around the Freidrichsburg Farm, and the Landgraben (canal, stream or man-made drainage ditch I’m not sure). Well, one hiccup was the camera batteries, after 3 pics they died. No problem, I carry reserves, except they were flat too… err… no more photos then. So, I’ll keep this short(ish). The Germans were choosing a force from the 1944 Panzer Division lists (from Overlord), as 5th Panzer were still a recognisable, organised force (if very depleted). It would also be one of the few chances for my opponent to use his armour in anything like any numbers. His panzers were 2 Pz IVs and a StuG (we allowed him to combine them into an ersatz platoon) supported by a Jagdpanzer IV (L70 of course, but 5th Panzer still had 12 of these in April 1945) for serious anti-tank defence. With them was an armoured panzer grenadier platoon (first outing for these models in years, which is part of the point of playing the campaign), a bit of other sundry support (Pak38, Forward HQ, recce sniper and armoured recce squad) and 120mm off-table arty support. My red tide was led by my long unused ISU-122s (hell yeah! ), both mighty weapons in the open ground I’d have to cross. With them came a platoon of T34/85s, all with tank riding SMG-armed squads (with captured Panzerfausts, how novel!!). A platoon of cheap riflemen (cannon fodder), 2 recce T34/76s (awesome recce power), and a BA-64 armoured car to spot for off-table (obligatory) 120mm mortars. The ISU-122 and Jgpanzer IV traded first shot as maximum range, and missed a lot, then withdrew to rearm from newly arrived supply trucks. More mortar fire was landing on the Friedrichsburg Farm and one accurate shell knocked out the German CO in his half track, a lucky bonus for me… the Germans had lost 2 officers are were down to just 1. I still had all 5… (FHQ, Platoon HQ, T34 Platoon HQ, ISU-122 Battery HQ and VVS Officer). No shortage of orders for me. As my main armour and tank riders arrived, so it was time to go. 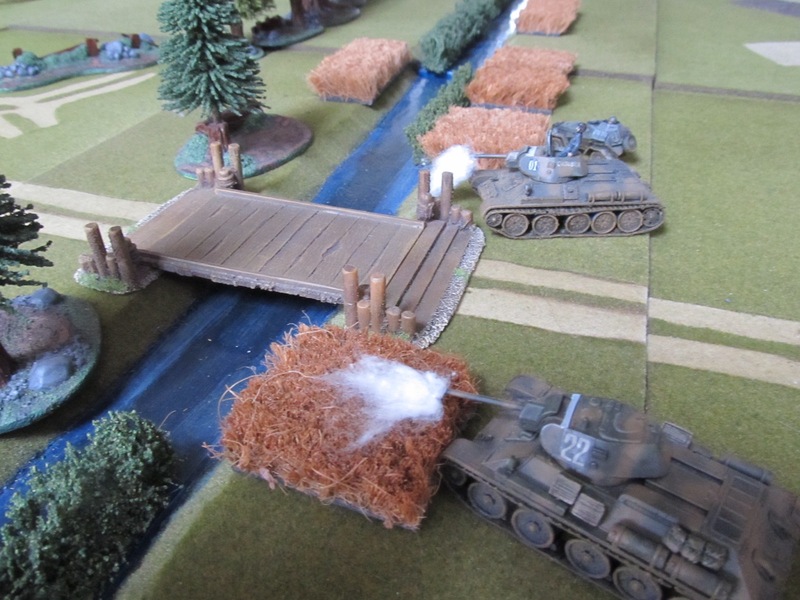 With a good orders roll I pushed boldly forwards as ambush fire from the Pz IV and StuG fizzed passed. An ISU-122’s returning fire annihilated the StuG, outclassed on this battlefield. Mortar rounds pinged of my ISU’s side armour and one even took a 75mmL70 hit to the front glacis and rolled on unscathed… not many survive a hit from those guns. It was going well, except that my chit pulls had been bad, mostly 4s, and not an aircraft in sight (I brought a VVS officer along, feeling lucky!). My timed air strike PE-2 dived in and bombed the farm, and scored a few pins… cursed by the Germans, whose 20mm flak truck hadn’t got on the table yet… arriving a turn too late to do its job. The crucible of this battle would be the very centre, a barn and its small fields around it. My infantry was running towards it at full speed and my tanks had debussed their SMG squads, whilst the Germans were still pinned down in their half tracks. My infantry reached the barn and took the objective as tank fire was still being traded, and my T34-85s were a match for the Panzer IV (if they could hit), which was now pulling back to re-arm with more AP shells. On my left I send my T34/76s recce units into another advance, hoping the mounting pressure would be too much for the Germans dwindling number of orders. The red tide was coming in fast. Here, things started to turn for the worse, I’d had far the better of the early turns… but then my leading T34/76 took a hit from the PaK38, which glanced off, but pinned it. Then, the 37mm door-knocker (SdKfz 251/10) opened fire, scored 2 more hits, both bounced off too, but the rattled crew abandoned the tank and ran. First Russian tank lost. Next, the German player's unpinning chit turned up a Air Attack. On his next turn, he rolled a 6… the Luftwaffe arrived (what?) in the form of a Ju-87G, 37mm cannon-armed and piloted by some little Hans Rudel wanna-be… his first strafing run destroyed the second T34/76 in a blaze of 37mm cannon shells. 2 more counters (both big numbers again). In the centre the panzergrenadiers finally got going. Unpinned, these veteran assaulted the barn, but only after their MG had pinned the squad inside (the right way to do it). Their attack, potato mashers first, wiped out my pinned SMG squad who couldn't fight back. More MG fire from their half tracks pinned my following infantry squads in the fields, he was seizing back the objective. The JgPanzer IV also reappear, fully armed up, and its first shot hit an ISU-122, which brewed up this time… drat, one of my big-beasts was gone and the chit was another 4! 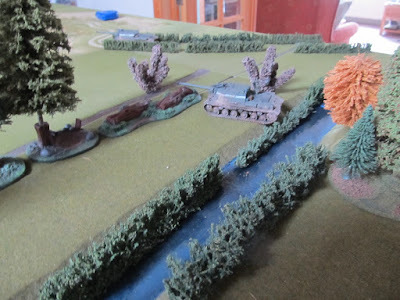 The battle would be decided at the farm, my tank’s MG’d up the enemy infantry and fired at the half tracks behind (easy counters), missing about 5 times (on 4+, frustrating-yep! )… my attack was coming apart. In desperation I tactically co-ordinated to get an SMG squad back in the fight, and they were ordered to assault the barn (they excel at this work)… and promptly refused (and went back pinned again, grr!). Incoming MG fire was just too much for them, obviously. Argh! That was another counter taken (a 4), for nothing, and I was close to breaking. The fight of the barn sucked up the few German orders (low rolls for 2 turns making things tricky and cut his mortar fire to nothing). But his grenadiers moved into the field and used its covers to unleash a Panzerfaust. My lead T34/85 took the hit and, Kaboom! was a-goner… another counter. I was at 34 from 38 so should be just OK. No. A 5, and my Russians had broken. 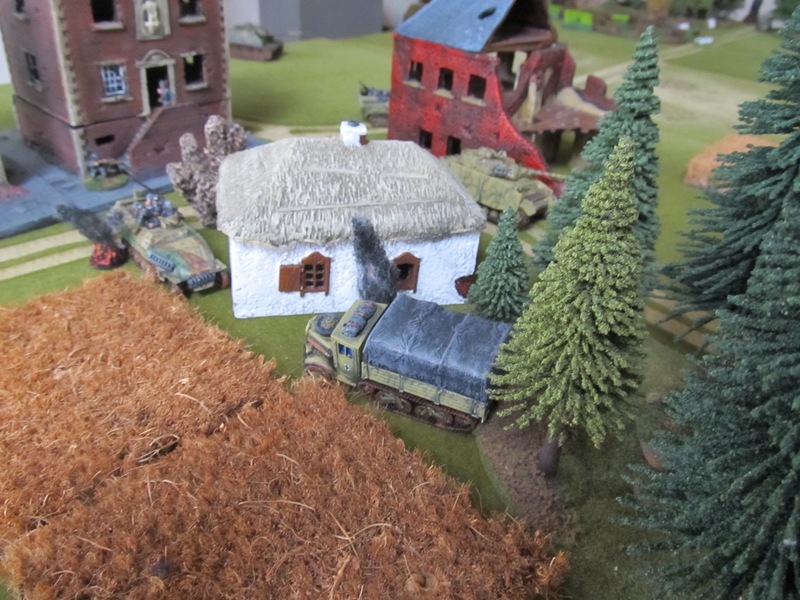 The fight at the barn had been a German win, those veteran grenadiers had shown how it should be done, keeping a lot of Russian at bay with their MGs. My thrust had been halted and it was time to pullback, and shell this area flat for a later attack. 5th Panzer’s counter had stalled my advance. The Germans gained the campaign points for the win (and a solid one, having 12 BR still left). So, after 1 win apiece, the Germans have 3 campaign VPs, and the Russians have 3 campaign VPs. Here are the three photos I got… Game 3 is already set for first week in Feb. 548th Volksgrenadiers will be fighting a rearguard delaying action in an outlying village. If I can win that game, my troops will be into Konigsberg's suburbs. If I lose, 5th Panzer get another counter-attack chance. The AAR will follow. Germans move into the Friedrichsburg Fram, under incoming mortar fire... hence the pinning. My recon, two T34/76s, await on ambush fire at the cart bridge (crossing it had a chance to collapse it). BA-64 behind calls in the mortar fire. ISU-122s trade fire at long range with the Jg Panzer IV, whilst incoming mortar shells do nothing. Crossing the Landgraben stream (ditch) was very hard going, dangerous ground and a obstacle as well. Very timely, reread the first one earlier today. Nice write up, shame about the batteries. When you exploit all the Moving Services that organizations now offer, it can be a substantially simpler errand than you suspected. Each administration is normally connected with an individual expense, however when you utilize more than one movement benefit from a similar organization, you will get the advantage of a bundle arrangement or rebates that you won't discover somewhere else. Our solid movers give nearby and long division moving associations. Here are associations accessible for the mover, movers, moving company, moving work, moving associations and moving work. We are giving the best associations in especially sensible costs. We are proficient in moving associations with orchestrated work. Great Moving is a #1 Movers NYC. They are Most recommended movers in Yelp. Great Moving is affordable and trusted movers.